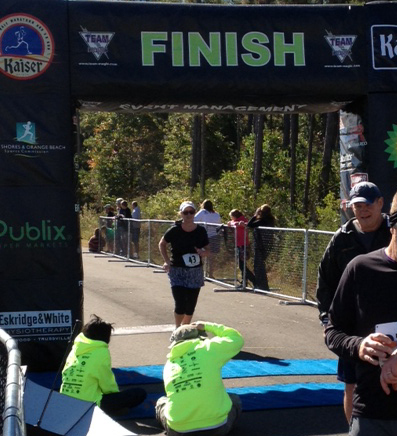 The Orange Beach Kaiser Realty Half Marathon and 5k has now come and gone, and a more spectacular day could not have been ordered in advance. Weather at the start was sunny and a little on the cold side (for me) at about 47 or 48 degrees, but it warmed up nicely. Kaitlyn (my youngest daughter) ran the 5k, had a blast, and surprised herself, I think. 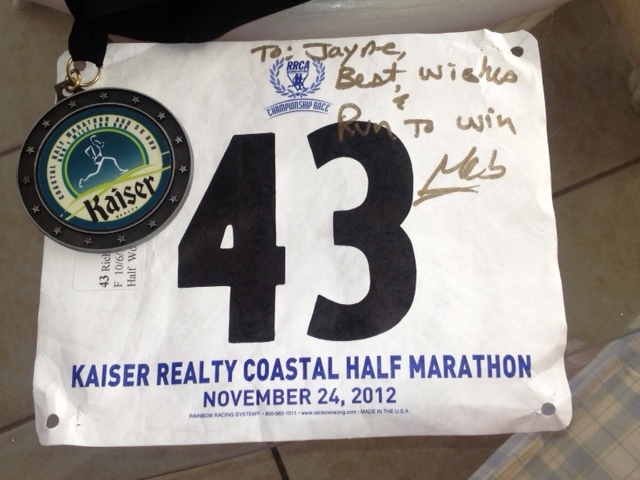 I ran the half, looking to maintain a 12 minute pace, which I accomplished, but I didn’t have a great race overall. In spite of the perfect weather and beautiful run, apparently the gastronomically challenged should not plan a half marathon two days after Thanksgiving. If you read my last post, I did live to regret the Italian Creme cake I ate, as it added at least 8 minutes to my overall time. Enough about that, though. I choose to place this one in the win column, because 1) I still managed to stay on pace, and 2) it was a perfect day for racing. The after race meal was provided by Cosmos Restaurant, here in Orange Beach, AL, and, having eaten there this summer, Gary, Kaitlyn, & I all stayed to eat. It was absolutely worth it, too. Probably the most unusual post race meal I’ve ever had, but, without a doubt, the best. The race was well done, the route clearly marked, lots of volunteer help to guide and hand out water and Gatorade. 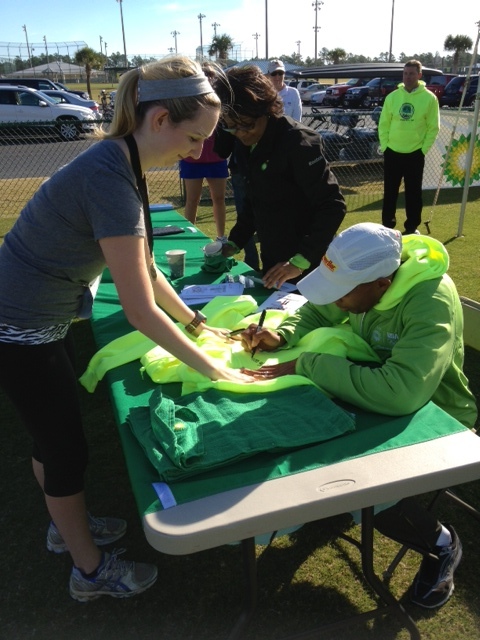 The packet pick-up yesterday had a few kinks, but they all seemed to be worked out this morning. 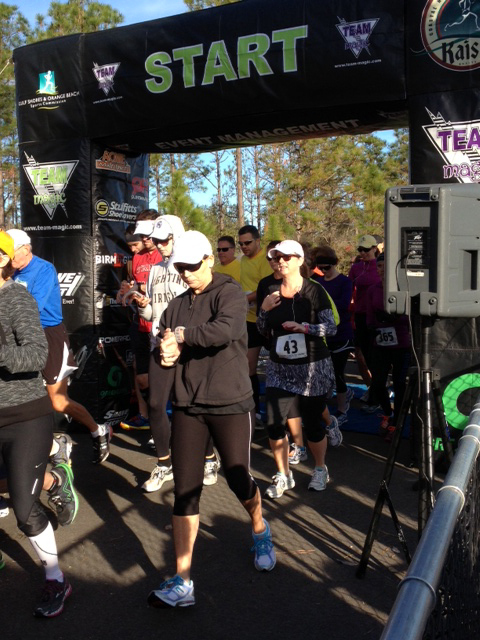 This is a beautiful race, mostly along the Backcountry Trail system in Orange Beach with a few miles run on the roads. There was plenty of police presence on the highway, so the runners were well protected from traffic. Gary & I have ridden our bikes & run on the Backcountry Trails and knew that they’re well maintained and breathtakingly beautiful. And, in the summer, they have the added bonus of much needed shade. The only complaint I can think of right now is one that I have for most races, not enough bathrooms. Kaitlyn had a great race! Meb made a guest appearance, and I was quite starstruck. 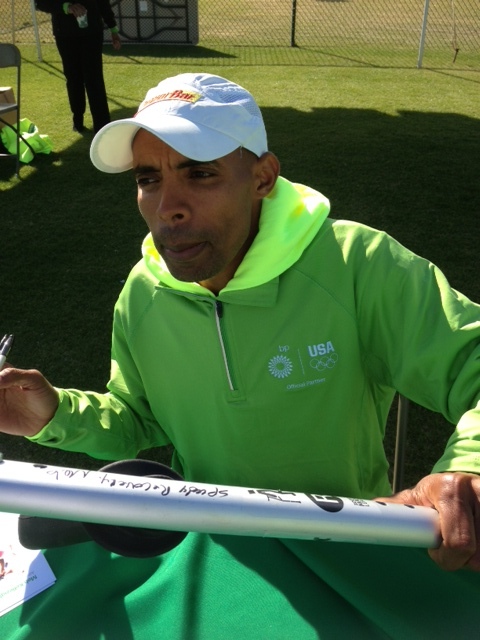 My wonderful man patiently stood in line and got Meb’s autograph for me, then waited as I stood in line to do the same. 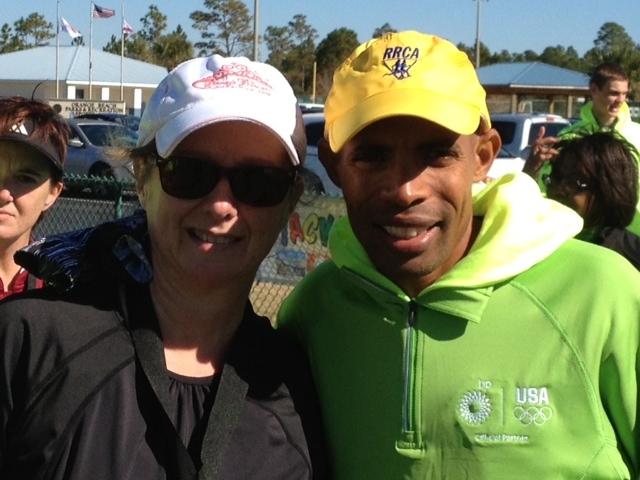 Even Kaitlyn, who had never heard of Meb before this weekend, got in on the fun. 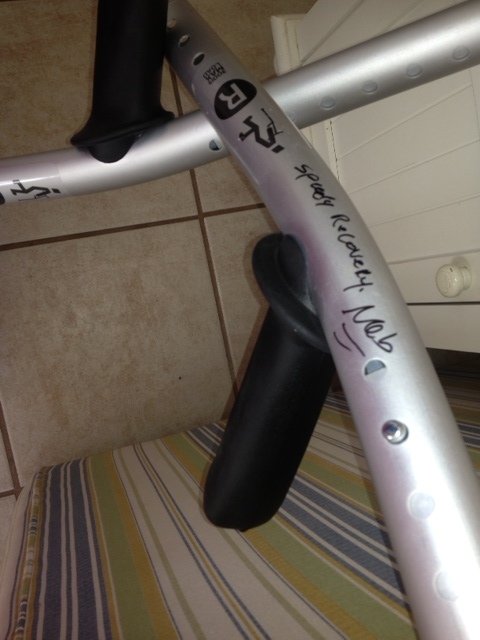 Gary had some unconventional things to sign. Yes, that’s his crutch. Meb had a lot of encouragement for Gary about injury recovery. On Facebook this month, a lot of people have been listing things they are thankful for daily. I love that. Although I haven’t participated publicly, I’ve enjoyed reading my friend’s posts and marveled at how blessed we all are. Probably my favorite thing about social media is seeing photos of friends and family and keeping up with their lives. Okay, sometimes, they overshare. But, that’s a post for another day. I try to live my life in a spirit of Thanksgiving, consciously verbalizing prayers of thanksgiving when I first open my eyes each day and before I close them again each night. There are so many blessings in my life, and I am humbly grateful. No one deserves them less, but no one is more grateful. Today is always a wonderful reminder to be thankful for the bounty we have as a nation. For health, friends, and family. My day started early with preparations for lunch for six, going to the nursing home to see my Dad, then loading our van for a few days at the beach. It’s race week for me, and I’m more than excited about race day on Saturday. Perfect weather, my daughter running the 5k while I run the half, my man at the start & finish lines waving his crutches, cheering us on. 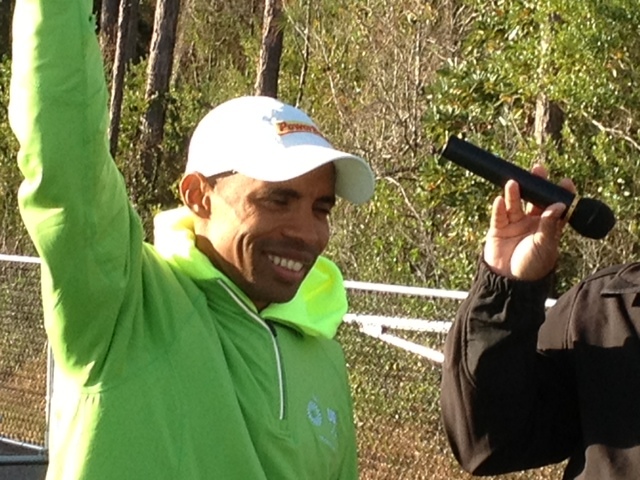 Even a celebrity appearance by Meb. Can. Not. Wait. I may have over-embraced my taper week, to the point that I feel a little fat and lazy. Hopefully, it will give me fresh legs and not adversely affect my race. The huge slice of Italian creme cake I had for dessert today, on the other hand, I may live to regret. But, life is short, and I don’t eat dessert very often. My list of blessings is long. At the very top is my crazy husband with his wicked sense of humor who is my best friend and strongest supporter (as well as a fairly mean coach). I like him so much more now than I did all those years ago when I married him. And, I really liked him then. He inspires me in more ways than he knows. When I feel like slacking, all I have to do is think of how hard he is working with his physical therapy and I push on. If he can do the workouts he does with a broken leg, I can get my tush in gear and out the door on days I don’t feel like running. It’s harder for him to inspire me to strength training, so he usually guilt trips me to it. It’s working, though. And, it’s helping my training a lot. I really hate it when he’s right, especially about strength training. My beautiful daughters inspire and motivate me to keep running, and they even join me on occasion. My sisters encourage me, help me carry the load, and pray for me, my sweet daddy is a treasure to all who know him and passed his strong will on to me. My girlfriends are sisters of my heart. I’m truly thankful for them all, today and everyday. Laughter around the holiday table is music to my heart. Tonight, I’m thankful for the quiet serenity that the beach provides, a lovely place to enjoy it with my family, a glass of wine on the balcony, leftovers for supper, and the ability to run the race on Saturday. I’m thankful that the sneezy, achy, cough I felt coming on yesterday disappeared in a cloud of peppermint schnapps last night, and so far hasn’t reappeared to ruin race weekend. And, I’m thankful for a papaw who taught me that little trick many years ago. I’m thankful that, even though I forgot the sweet tea and the bottled water and now I’ll have to go to the store on Black Friday, after all; at least I remembered the wine and the coffee. A girl has to have her priorities. I’m thankful for what running has brought to my life as I get older. The peace that fills my soul after a good run, the thoughts and creativity that runs inspire, the unbreakable bond to my Creator that is reinforced with every step. And, finally, I’m thankful that although I may not be able to run one day, today is not that day. For a self proclaimed anti-racer, I’ve been lining up at a lot of starting lines lately. Blame it on the magnificent weather, which dawns a little on the too cold side, then blossoms into a beautiful sun filled day. Or, blame it on the fact that my training has been going really well lately. So well, in fact, that I kind of overdid it a few weeks ago and ended up with some unwelcome off days to rest a slightly inflamed ankle. Old ankle injuries apparently never really die, they just go into hibernation until you make them mad, then they come roaring back to life. Fortunately, a week off worked wonders, and I even raced on it at the end of that rest week, to beat my 5k PR by almost a full minute. Yes, racing is fun to me, finally. Whatever is to thank (or blame) for it, I’m grateful. 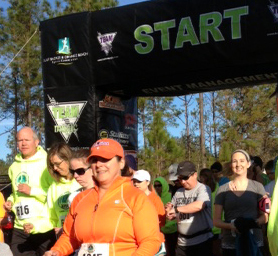 Yesterday found me at the starting line of another local 5k, this one very small, maybe 30 racers total. It was a benefit for Bethany Christian Services, and was in the beautiful Bellegrass subdivision of west Hattiesburg, which has a surprisingly hilly course. I signed up on race morning, as this was a last minute decision, and the early morning cold almost made me change my mind. I wasn’t sure I should even race this weekend as next weekend is my next “real” race, a half marathon in Orange Beach, Alabama. But, my training schedule for the half has been erratic, at best, since Gary’s accident, so I figured, why not throw in a last minute 5k to make things shake, rattle, and roll? Gary & I loaded up early, got coffee at Starbucks (he ate cake, I had my usual 5k pre-race meal of coffee & hard boiled egg), then headed out to find the race site. I didn’t really have a race plan, but once I started running, I just pounded it out to the end. Up hill, down hill,up hill again. Past groups of chattering young women, a few men who were taking an easy morning jog, and around the beautifully laid out development to the last hill at the finish line. Hate hills at the finish line, by the way. 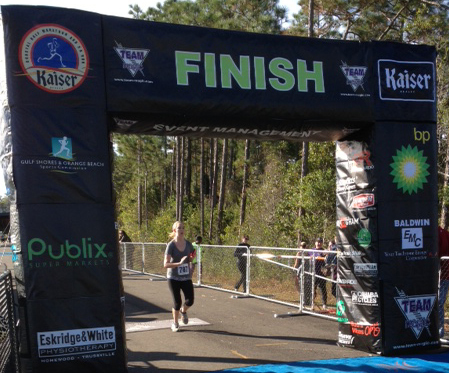 Ended up shaving a couple more seconds off my PR and winning my age group again. Not that difficult, but I also blew past a lot of women much, much younger than me. Well, blew past may be a little on the extreme side descriptively, but I like the way it sounds. I love how small town races reflect the diversity of the running community. People in all sizes and shapes, in all ages and stages, with varying skill and speed levels, all line up for a good cause and a little exercise. There were two young boys (maybe 8 or 9) who were just ahead of me for most of the race. They were obviously racing each other and unconcerned about the race as a whole. One made a dash into the woods and I thought, Ok, I’ll pass them now. But, no, they easily got back on course and were pacing each other and punching each other for the next 27 minutes or so. I would gain on them, then they effortlessly glided ahead and away while laughing and hollering. My breathing sounded like I had on Darth Vader’s mask, and any conversation on my end was short and to the point. They danced across the finish line a full minute ahead of me, with energy to spare and slaps and giggles all around. Loved it! That’s what running is all about. Fun, camaraderie, testing yourself, pushing limits, trying new things, making new friends, and more fun. Runners come in all sizes and shapes (thank goodness! ), and isn’t a one size fits all sport. You never have to run a race, or be particularly fast to be a runner. I have lots of fast running friends who never talk down to my slow, plodding times. They treat me like what I am – a runner. I heard on a podcast the other day that a real runner never asks you what your finishing time is, they just rejoice with you that you finished. I have to agree with that. All the runners that I consider “real” runners are exactly like that. They know that their only real competition is themselves, and continually strive to better their own performance. Most of us will never win a major race, or even place in our age groups in those races, but we’ll finish all the same and be happy, content, stronger, and healthier than our non-running friends. And, really, isn’t finishing well what life is really all about? I love Zig Ziglar. He’s corny and old-fashioned, but he is spot on in his presentations. He makes me laugh and he makes me think. Anyone who can do both of those things is more than all right in my book. I listen to his podcasts often when I’m running, and recently he made the comment that I quoted above. My initial reaction was, “What? That’s not the way I learned that!” But, as he talked, and I began to reflect on what he said, I realized he was right. His point was that when we start something new, we are seldom going to be good at it at the beginning. It may take years of doing something before we finally begin to do something well, or even just do it better than before. I used to limit myself to only pursuing things that I felt accomplished at, things that I didn’t have to work hard to do well. That list is pretty short. Eating and sleeping are about the only things I can do well with little effort. It seems I’ve encountered a lot of people lately who say they can’t run. They’ll marvel over the fact that I train for and race half marathons (remember these are people who have never seen how badly I actually run), then they sigh and say, “I wish I could run.” My response to that is almost always the same. If you really want to be a runner, you can be one. There are very few things which truly disqualify you from becoming a runner. Just look at the roster of any race and you will see many, many people running with disabilities far worse than your own. There are, of course, some disqualifiers, but search yourself, talk to many doctors, do some research if you think you have one of those. It just might be that you can be a runner, if that is something you truly want. Running isn’t for everyone. I have a friend about my age who does competitive dancing. That’s something I would do really badly for a very long time if I took it up. But, as beautiful as it is to watch, I don’t have the desire to become a dancer. Other than around the house and to embarrass my daughter, that is. It’s the same with running. It may not be for you. But, if you want it, you can have it. Here are a few tips that will hopefully set you on your way. Know that it’s going to be really easy. 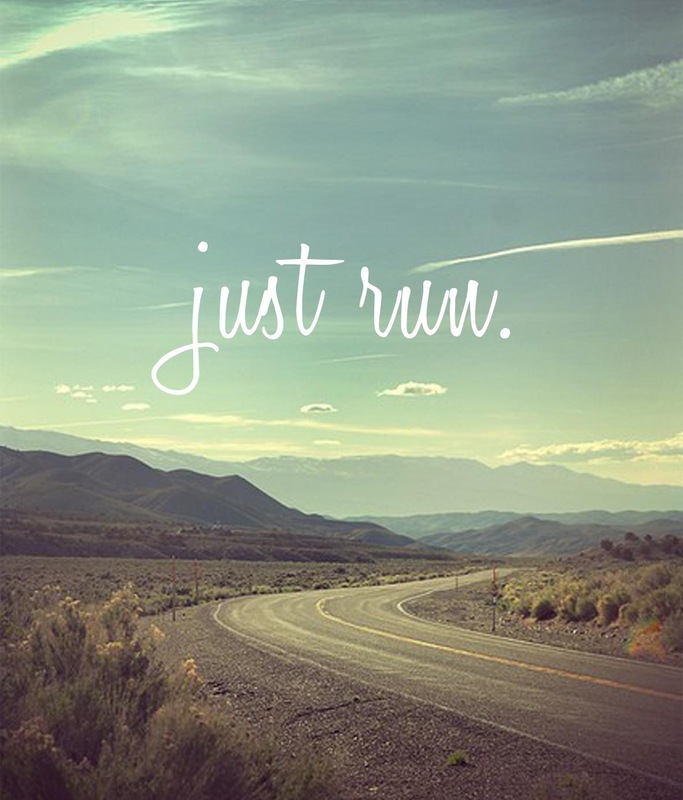 All you really need is a good pair of running shoes, comfy clothes, a safe place to run, and a good sports bra. Men, you’re exempt from that last one. There is a lot of icing to go on the cake after you establish some good running habits, but to begin, that’s all you need. Don’t worry about pace or distance. Concern yourself with working up to running 30 minutes. Don’t even start a running program until you can walk 30 minutes. After that, start sprinkling in some 20-30 second running spurts. Easy does it, what’s your rush? Before you know it, you’ll be running 30 minutes and ready to challenge yourself more. 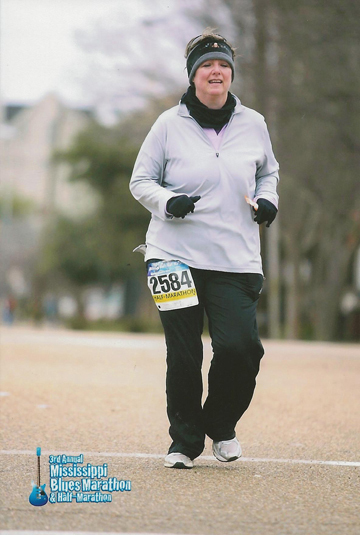 In the spirit of becoming less prideful, I’m including my race picture from my first half marathon in January of 2010. Hope it makes you feel just a little bit better about how you look when you run. In my defense, it was 19 degrees at the starting line and started snowing on mile 7. And, don’t think my eyes are closed because I’m praying. Although, I may have been. But, be assured it was more “please let this be over soon,” than some lofty prayer for world peace. 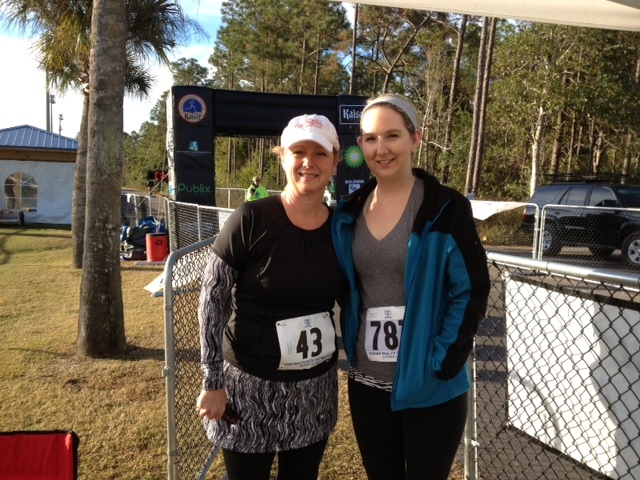 My goal for 2013 is a good race pic. Calling all my photographer friends to come give it a shot. And finally, remember that running is more mental than physical. When I was growing up my dad had a saying, “Can’t never could do anything.” I never fully understood that until I became a runner. If you believe you can, you can. It may take a lot longer than you want it to, and it will certainly hurt a lot more than you want it to, but you can do it. Never, never say can’t. 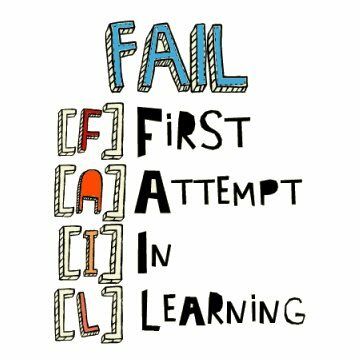 You have permission to fail as many times as you need to. I still have bad runs. Fortunately, though, these days, the good ones far outnumber the bad. That keeps me lacing up and heading out to try it again another day. I’ll be honest. The election and all its accompanying rhetoric have rendered me almost mute. I’ve written many posts in my mind as I ran, only to discard them at the end of the run, like so much election babble. I turned off the news by Friday of last week, made a graceful exit from Facebook with all its divisive (and all too often, ignorant) comments, opened up my Bible and filled my mind with God’s promises. The anxiety that the uncertain, evil, and uneducated world has been causing me is slowly melting into a puddle at the feet of the cross. Praise Jesus. I’ve replaced the annoying talking heads with Joyce Meyer, Andy Stanley, and, yes, I’ll admit it, Sheldon Cooper. If you’re a Big Bang fan, you know. If you’re not, you should be. Excellent anxiety medicine in the form of laughter and nonsense. Love me some Sheldon. He feels like an old friend. Not sure what that says about my friends, but there it is. I voted my values today, my sister and I took our Dad, who also voted his values, and my daughter voted her values in her very first presidential election. Today is in the win column for me, no matter who goes into the White House in January. Because at the end of the day, it really doesn’t matter a whole lot who’s there. God is still sovereign, even if we’ve become a nation that doesn’t recognize that. I’m not going to make an election post. I’m not going to tell you who you should vote for or what the issues should mean to you. Or even what they mean to me. I am only going to say this. I’ve been in deep, unprecedented prayer for our nation for the last few days, and don’t intend to stop, no matter who gets elected. Our nation is at a very frightening crossroads, and I pray that we will make the right choices, turn our faces back to God, and allow Him to heal our wounds. A few months ago, our pastor gave a series on the things that make a church grow and those things that make one die. One of the things that make it die hit me right between the eyes. Division. It didn’t hit me about our church, it struck me about our nation. We are no longer a nation united, we seem to be divided now in ways that frighten me. We can no longer have a difference of opinion without dissolving into screaming and obscenity and refusing to listen to any layer of compromise. Hate has become a national watchword, but the real haters don’t even seem to know that they hate. We can no longer call sin sin without the risk of offending someone, and indeed, being called hate mongers or worse. When the one we are actually offending is God Himself. We seem to have no problem doing that. The divisiveness in our country makes me sad, and is never going to be healed by a person, political or otherwise. Only One has the answer, and we have turned our back on Him as a nation. Again, I’m not going to talk politics here. Haven’t we heard enough of that? I believe in our country. I believe in the spirit of our nation that made it great. Hope. Hard work. Kindness. Helping those who are less fortunate. Most of all, love. 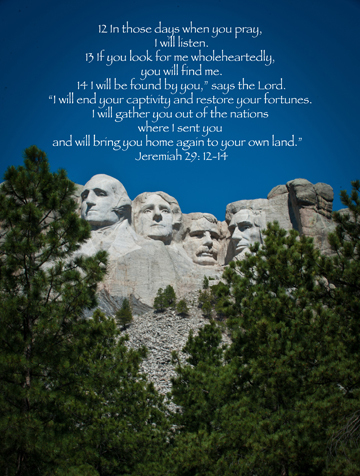 My prayer is that we (and I’m talking to my Christian brothers and sisters here) join together in prayer to lift our nation up, to help turn it back to God. We’re not going to accomplish that by screaming in the faces of the very ones we’ve been sent to save. So, maybe we need to start by praying for ourselves. It’s easy to love like minded people, can you find it in your heart to love those who don’t think like you? What about the ones who really don’t like you? The ones who live truly abominable lifestyles? Or the ones who are good people, but have no idea that their lives are scarred with sin. Because, let’s face it, mine is scarred with sin, too. So is yours. I can say that with no doubt. It doesn’t really matter who gets elected today. We may not even know until next week. I haven’t listened to one exit poll, I’ve not heard one talking head give me his/her opinion, I’m not listening to the nay sayers or the gloom and doom prophesiers. I know Who is in charge. I know Him intimately. And, He’ll be there no matter who sits in the Oval Office. The question is, what are we going to do to make sure He’s not done with us? When we pray, He listens. When we look for Him, we find Him. Let’s fall on our knees and pray for our nation, my friends. It’s time.